FIRE ANTS are one of the most dangerous and aggressive ants. They live in colonies made up of a queen, male drones, and female workers. Fire ants have a painful sting which can cause swelling and bumps. They can adapt to any place or environment. They are also survivors. For example if lots of water enters their nests, they will come together and form a huge ball or raft that is able to float on the water! 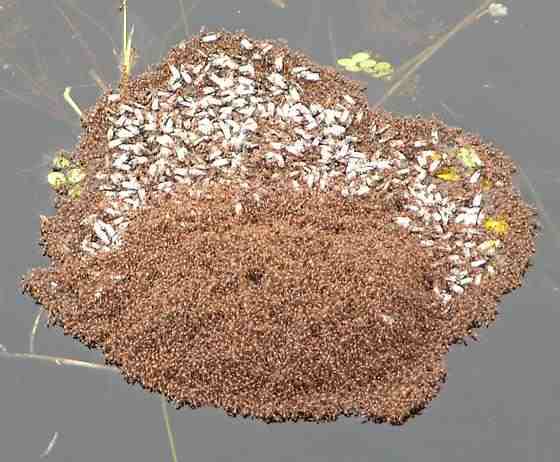 Fire Ants are dark reddish brown with oval bodies. Their bodies are divided into a head, thorax and abdomen. Fire ants also have three pairs of legs and a pair of antennae. They live in large mounds in open areas and feed on plants, seeds and even crickets. Their nests are usually made in soil near moist areas.Sometimes, their mounds are as high as 40 cm! Fire ants often attack small animals and kill them.When they bite, they send a poisonous sting into the bite. This sting feels like burning fire. This is why they are called fire ants! And the dangers thay bring! !